New England English is not a single American dialect, but a collective term for a number of dialects and varieties that are close geographic neighbors within New England, but which differ on a spectrum that broadly divides New England English into a unique north versus south (specifically, a northern merger of the vowels /ɒ/ and /ɔː/, versus a southern distinction between these vowels), as well as a unique east versus west (specifically, an eastern pronunciation of the "r" sound only before vowels, versus a western pronunciation of all "r" sounds). 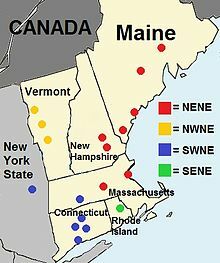 Regarding the former feature, all of northern New England (most famously including Boston, but going as far southeast as Cape Cod and as far north as central Maine) historically merges the open and open-mid back rounded vowels (so that, for instance, pond and pawned are pronounced the same, which is commonly called the cot–caught merger), while southern coastal New England (including Rhode Island) historically maintains a noticeable distinction between these two vowels. Regarding the second feature, all of eastern New England is historically non-rhotic (famously pronouncing "car" like "kah"), while all of western New England is historically rhotic (or "r-ful"). Therefore, four combinations of these two features are possible, and coincidentally all four exist among New England English speakers, largely correlated with the exact geographic quadrant in New England in which a speaker was raised. All the local dialects of New England are also known for commonly pronouncing the unstressed sequences /tɪŋ/ and /tən/ (for example, found in "sitting" /ˈsɪtɪŋ/ or "Britain" /ˈbrɪtən/) as [ʔn̩] ( New England pronunciation of "mountain"). This form of t-glottalization (especially the /tən/ form) is found commonly in other parts of the country as well, like in the word "Britain" (sometimes represented along the lines of Brih'in). As in the rest of the Northeast, sneakers is the primary term for athletic shoes, and common typically before adjectives or adverbs, wicked is used as an intensifier word (predominant in Northern and Eastern New England English, from Boston). Many Boston-originating local terms have dispersed throughout Eastern New England and, prominently, all the rest of Massachusetts. ^ Labov (2006), p. 227, 229, 231. ^ Labov (2006), p. 148. ^ Boberg (2001), pp. 24-5. ^ a b c d Labov (2006), p. 225. ^ Boberg, Charles (2010). The English Language in Canada: Status, History and Comparative Analysis. Cambridge University Press. p. 156. ISBN 9781139491440. ^ Labov (2006), p. 84. ^ Labov (2006), p. 82. ^ Vaux, Bert and Scott Golder. 2003. " What do you call the long sandwich that contains cold cuts, lettuce, and so on?" The Harvard Dialect Survey. Cambridge, Massachusetts: Harvard University Linguistics Department. ^ Vaux, Bert and Marius L. Jøhndal. " What do you a call a store that is devoted primarily to selling alcoholic beverages?" Cambridge Online Survey of World Englishes. University of Cambridge. ^ Vaux, Bert and Scott Golder. 2003. " Which of these terms do you prefer for a sale of unwanted items on your porch, in your yard, etc.?" The Harvard Dialect Survey. Cambridge, Massachusetts: Harvard University Linguistics Department. ^ Vaux, Bert and Scott Golder. 2003. " What do you call a traffic situation in which several roads meet in a circle and you have to get off at a certain point?" The Harvard Dialect Survey. Cambridge, Massachusetts: Harvard University Linguistics Department. ^ Vaux, Bert and Scott Golder. 2003. " What is your *general* term for the rubber-soled shoes worn in gym class, for athletic activities, etc.?" The Harvard Dialect Survey. Cambridge, Massachusetts: Harvard University Linguistics Department. ^ Szelog, Mike. " Ayuh, the Northern New England Accent in a Nutshell." The Heart of New England. ^ Wolfram, Walt; Natalie Schilling-Estes (1998). American English: Dialects and Variation. Wiley-Blackwell. ISBN 978-0-631-20487-9. ^ Fitzpatrick, Jim (2006). "Beantown Babble (Boston, MA)". In W. Wolfram; B. Ward (eds.). American Voices: How Dialects Differ from Coast to Coast. Wiley-Blackwell. ISBN 978-1-4051-2109-5. ^ Boberg (2001), pp. 19-27. ^ Nagy, Naomi; Roberts, Julie (2004). "New England phonology". In Edgar Schneider; Kate Burridge; Bernd Kortmann; Rajend Mesthrie; Clive Upton (eds.). A handbook of varieties of English. Volume 1: Phonology. Mouton de Gruyter. pp. 270–281. ^ McCarthy, Corrine (2010) " The Northern Cities Shift in Real Time: Evidence from Chicago". University of Pennsylvania Working Papers in Linguistics: Vol. 15 : Iss. 2, Article 12. Boberg, Charles (2001). "The Phonological Status of Western New England". American Speech. 76 (1): 3–29. doi: 10.1215/00031283-76-1-3. Szelog, Mike. "Ayuh, the Northern New England Accent in a Nutshell". The Heart of New England.